The Fire Sense 60660 is a “new revolution in outdoor heating,” as claimed by the manufacturers. It runs on electricity, and it’s “less expensive to operate than propane patio heaters.” And apparently safer, silent, and more attractive. How so? The concept is simple, but unlike most patio heaters, the 60660 is not free-standing. Instead, it hangs from the ceiling like a chandelier. And since there are no toxic fumes to worry about, you can use it both indoors and outdoors. In this Fire Sense 60660 hanging halogen patio heater review, we give you our concise, yet detailed analysis of the product. the Fire Sense 60660 here. – Appearance. 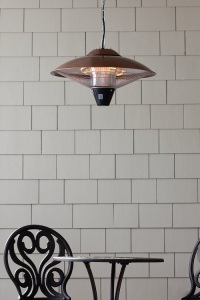 The general consensus is that this hanging halogen outdoor heater is “attractive.” The copper finish adds elegance to the unit, and consumers couldn’t be much happier with the light it casts. – Use or Functionality. As mentioned above, the Fire Sense 60660 gives plenty of light. That said, several consumers also use this unit as a lamp or to promote ambiance light. You can use this heater hanging at your back porch, gazebo, outdoor dining table, pergola, or even in your barn to provide heat for your farm animals (as one does). – Safety. Since this is electric-dependent, you don’t have to worry about gas leaks or inhaling toxic compounds such as carbon monoxide. Plus, they’re a safe alternative with small children around, as one consumer said. – Heating Performance. There are conflicting feedback as regards the amount of heat this unit provides. But as we analyze it, the 60660 may not make you feel toasty warm especially during chilly nights. While it does give out heat, it can’t compete with other patio heaters. The Fire Sense 60660 is an attractive piece of hanging heater that can double as a lamp providing plenty of light and a lovely glow. But based on consumer feedback, the heat it gives can be described as “mild,” and so it may not be satisfactory. Thus, this heater is recommended for an enclosed area, not for a completely open setting.